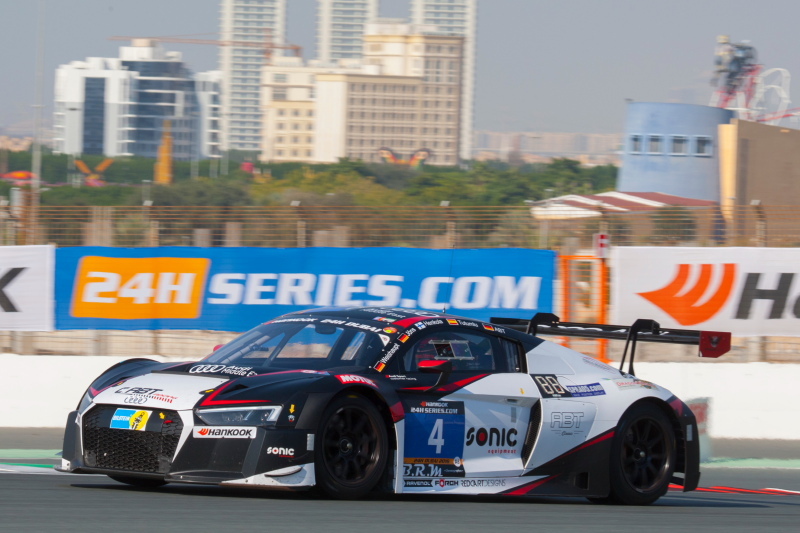 Audi teams locked out the front row of the grid in qualifying for the eleventh running of the Hankook 24H DUBAI. Driving the C. Abt Racing Audi R8 LMS (#4, Christer Jöns/Andreas Weishaupt/Isaac Tutumlu Lopez/Matias Henkola/Daniel Abt), German Christer Jöns achieved a fastest lap time of 1:57.892 minutes around the 5.399 kilometres long Dubai Autodrome to claim the first-ever pole position for Audi in the Dubai race. 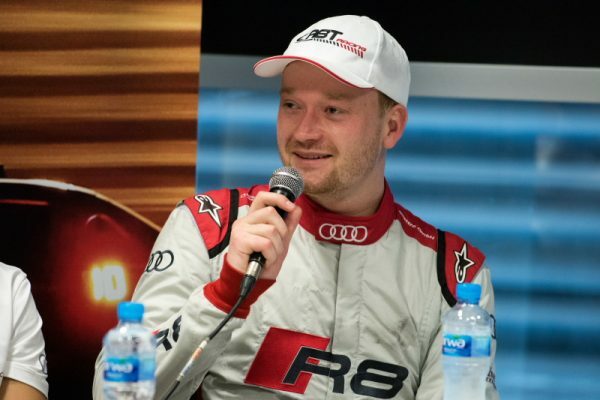 Fellow-German Christopher Mies made it a 1-2 for Audi teams by ending up second fastest with the Land Motorsport entry (#28, Marc Basseng/Christopher Mies/Carsten Tilke/Connor de Phillippi). Third-fastest overall and fastest in the A6-Am class was Dutchman Nicky Pastorelli with the V8 Racing Chevrolet Corvette (#333, Nicky Pastorelli/Alex van ‘t Hof/Rick Abresch/Wolf Nathan). Having already won pole position for the endurance race in Dubai two years ago, Pastorelli topped the time sheets in qualifying for this year’s race for a long time, but a last-gasp attack by the Audi teams toppled the Corvette from provisional pole position. 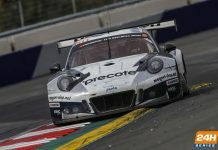 Christer Jöns showed the potential of the new Audi in Dubai and was even surprised by his own time: “I knew that we could be quick, but I hadn’t expected to be able to post a lap time of 1:57,” the German admitted. “Perhaps, the fact that conditions improved as the sun came down helped us as well.” With four Audi R8 LMS among the top six, Audi customer teams generally showed a strong performance in Dubai. 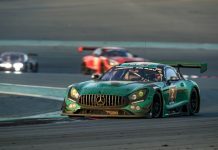 Next to the Corvette, the only other non-Audi in the top six was the brand-new Abu Dhabi Black Falcon Mercedes-AMG GT3 (#2, Khaled Al Qubaisi/Hubert Haupt/Jeroen Bleekemolen/Maro Engel, Indy Dontje) in fifth position. Pole position in the Porsche 991 Cup class went to Austrian Klaus Bachler with the Black Falcon Team TMD Friction car (#60, Burkhard Kaiser/Sören Spreng/Stanislav Minsky/Mark Wallenwein/Klaus Bachler) after a session-long battle with Dutchman Jaap van Lagen in the Lechner Racing Middle East entry (#80, Nicolas Missin/Bruno Tortora/Alex Autumn/Christopher Zöchling/Jaap van Lagen) with the second Black Falcon Team TMD Friction 991 (#61, Saud Al Faisal/Manuel Metzger/Gerwin Schuring/Saaed Al Mouri/Anders Fjordback) third-fastest in class. Frenchman Alban Varutti dominated proceedings for most of the time in the SP2 class, improving his own fastest lap time with the Vortex V8 GC Automobile GC 10 V8 (#203, Lionel Amrouche/Alban Varutti/Cyril Calmon/Mathieu Pontais) several times and ending up in pole position in class. Second-fastest in SP2 was the GDL team Asia Porsche 991 Cup (#77, Alberto Vescovi/John Iossifidis/Karim Al Azhari/Roberto Ferri/Gianluca de Lorenzi) from the Porsche Lorient Racing Porsche 997 Cup S (#64, Frédéric Ancel/Christophe Bourret/Pascal Gibon/Jean-François Demorge/Philippe Polette). British driver Bradley Ellis posted the outright fastest time in the first 30 minutes of qualifying for classes A2, A3, CUP1, TCR and SP3. With his time of 2:09.090 minutes, Ellis put his Optimum Motorsport Ginetta G55 GT4 (#223, Bradley Ellis/Ade Barwick/Dan O’Brien/Elliott Norris) on pole for the SP3 class. With the Century Motorsport Ginetta G55 GT4 (#229, Nathan Freke/Anna Walewska/Aleksander Schjerpen/Tom Oliphant) and the fastest of the two Nova Race Ginetta G55 GT4s (#284, Luca Mangoni/Gianluca Carboni/Roberto Gentili/Luca Rangoni /William Moore) second and third fastest in SP3 respectively, the top three was an all-Ginetta affair. In fact, the British sports cars even locked out the top five in class. In the A3 touring car class, German Bernd Küpper put his Hofor-Kuepper Racing BMW E46 M3 Coupé (#101, Bernd Küpper/Martin Kroll/Oliver Bender/Lars Zander/Michael Kroll) on provisional pole position early in the session and remained there until the chequered flag was out. Polish team RTG by Gladysz Racing’s SEAT Leon Supercopa (#21, Adam Gladysz/Marcin Jaros/Robertas Kupcikas/Jerzy Dudek/Simon Larsson) and the Peugeot 208 GTi of French Team Altran Peugeot (#208, Stéphane Ventaja/Thierry Blaise/Guillaume Roman/Kim Holmgaard) followed in second and third place. 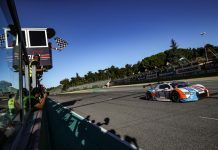 Reigning overall 24H SERIES powered by Hankook teams champions Memac Ogilvy Duel Racing got its title defence off to a good start as Phil Quaife claimed the TCR class pole with the team’s SEAT Leon Cup Racer (#1, Ramzi Moutran/Nabil Moutran/Sami Moutran/Phil Quaife). British team CTR-Alfatune ended up second with its SEAT (#126, Christopher Bentley/John Clonis/Adriano Medeiros/Robert Gilham), followed by Zest Racecar Engineering with another SEAT (#130, Andrew Hack/Daniel Wheeler/Kane Astin/Lucas Orrock). A tight battle in the CUP1 class for BMW M235i Racing cars saw British driver George Richardson with the Sorg Rennsport entry (#151, Ahmed Al Melaihi/Chris James/Rebecca Jackson/George Richardson/Ricardo Flores) just beating German Max Partl with the Bonk Motorsport car (#146, Rainer Partl/Hermann Bock/Max Partl). Team DUWO Racing from Luxemburg (#235, Jean-Marie Dumont/Maurice Faber/Frederic Schmit/Nicolas Schmit/Thierry Chkondali) qualified third in class. Qualifying honours in class A2 went to the presenza.eu Racing Team Clio, where Italian Luigi Stanco put the Renault Clio Cup IV (#112, Sonny Nielsen/Luigi Stanco/Stefan Tanner/Christian Dijkhof/Yoshiki Ohmura) on pole position. With the Besaplast Racing Mini Cooper S JCW (#165, Friedhelm Erlebach/Henry Littig/Fredrik Lestrup/Franjo Kovac) in second and the Team K-Rejser Peugeot RCZ (#171, Jan Engelbrecht/Jacob Kristensen/Thomas Sørensen/Claus Bertelsen/Jens Mølgaard) third-fastest, three different brands were represented in the top three in this class.